The mainfloor of this lovely Townhouse features riverfront views, 2 large size living rooms, a great kitchen with an island, master bedroom with a queen size bed plus a full bathroom with walk in shower. A pull out sofa is located in the woodsy living room. The second bedroom is upstairs with 2 twin size beds and a full bathroom. The stackable washer and dryer are located in the upstairs bathroom as well. 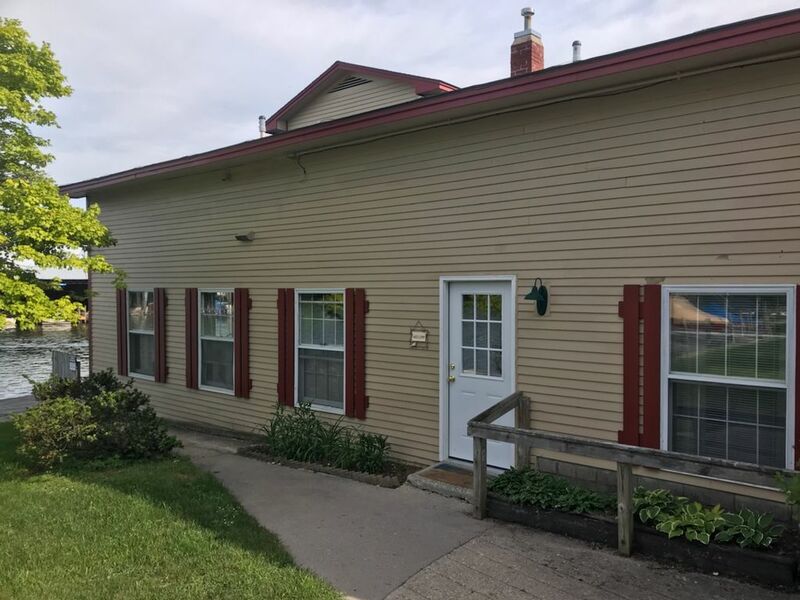 Located in the center of Leland and only 3 blocks from downtown; the property offers a boat dock with access to Lake Leelanau. Plus, convenient to shopping, water-sports, and entertainment. There are full bathrooms on each level. 3 blocks from Downtown Leland, otherwise called Fishtown. There is a dock, where a guest may dock their boat right in front of the Townhouse. The location was great. The house was adequate for our use but could use a bit of updating. The newer carpet was a plus. I’ve used VRBO several times and this was the first place that asked to have laundry done—a load in the dryer as well as one going in the washing machine. The rent included a house cleaning charge but I feel like we were required to do several things that the housekeeping charge should have covered. We enjoyed our stay at this Riverside Townhouse. It was clean, well-equipped, and decorated very nicely. The views on the river are nice. The four-star review is because it would have been much more comfortable during the ninety degree days, if there had been air condition on the main floor of the house. There is one window air conditioner in the upstairs bedroom, which has twin beds. The cool air circulates downstairs into the living room a little bit. There are fans that we moved from room to room, and ceiling fans in the kitchen and bedroom. These kept the air moving, and made it livable. We walked to town every night for dinner. There is a cute breakfast place right at the other end of the building that the townhouse is in. Overall, we had a great stay. Thank you for the review. We are glad you enjoyed your stay and hope to see you in the future. Comfortable and well equipped. Living room is a lovely place to feel the breeze and watch the boats go by. Easy walk to Van's beach. Half of the payment is paid at time of booking the reservation with final reservation due 30 days prior to arrival.